Referring to the violence erupted in Assam, Congress President and UPA chairperson Sonia Gandhi on Sunday called for swift action against people behind the violence. "What is happening to Northeast Indians is shameful. The guilty should be punished," she said. Sonia Gandhi said that the country belonged to all Indians and that they have a right to live in any part of the country. The Congress President also expressed concern over Assam violence and said, "Whatever happened in Assam is a matter of great sorrow and concern. Legal action should happen swiftly against those responsible for the incident, whoever they are." Sonia Gandhi was addressing a function to confer the 20th Rajiv Gandhi National Sadbhawana Award in New Delhi. The award with a citation and Rs 5 lakh cash was given to DR Mehta, the founder of Bhagwan Mahaveer Vikalang Sahayata Samiti. "All sections of the society should come together to create such an atmosphere. This is true service of humanity," said Sonia Gandhi adding that the situations that have arisen in the country today are the one related to social unity and harmony. "If we look at the history since Independence, the biggest challenge before the country has always come from those elements, who are enemies of social harmony and unity. Those, who have faced these elements and fought with them are the true warriors and in present circumstances, I consider only them true patriots," Sonia Gandhi said. "The Centre and state governments should take stern action against those disturbing social harmony," said the Congress President on Assam violence and exodus of Northeast Indians. Sonia Gandhi added that late Rajiv Gandhi always fought against social communal tensions, violence and and hatred and sacrificed his life fighting them. Dr Singh said that Rajiv Gandhi knew very well that India can progress only when all the countrymen can live together with peace, tolerance and harmony. Congress President and UPA Chairperson Sonia Gandhi called for strong action against those who are trying to harm the social harmony in the country. She also said that the ethnic clashes in the state of Assam was a matter of great sorrow and concern. "Whatever happened in Assam is a matter of great sorrow and concern. Quick and strong action should be taken against those responsible for the incident, whoever they are," Sonia Gandhi said addressing a function to confer the 20th Rajiv Gandhi National Sadbhawana Award in Delhi. Sonia Gandhi further said that all sections of society should condemn what happened in some states against the people of northeast after the ethnic clashes in Assam. "The central and the state governments should take stern action against those who are spoiling the harmony," she said noting that maintaining social amity was one of the biggest challenges before the country in the present circumstances. Sonia Gandhi underlined that the people of the country living anywhere have all the right to reside and work in any part of the country. The Congress leader also said that the biggest challenge before the country since Independence has come from elements, who are enemies of social harmony and unity and only those are true patriots who fought such elements and promoted social solidarity. Giving the award to DR Mehta, the founder and chief patron of Jaipur based Bhagwan Mahavir Vikalang Sahayata Samiti, Sonia Gandhi said Rajiv Gandhi always fought against social and communal tensions and hatred. "Social harmony was not an issue but the basic value for him," said Sonia Gandhi. 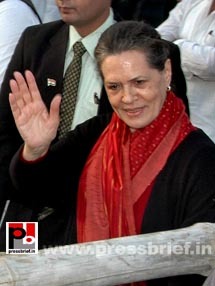 New Delhi: The Forbes magazine ranked Sonia Gandhi , the President of the Indian National Congress, stands at No. 6 in the list of most powerful women in the world. German Chancellor Angela Merkel is at the top. U.S. Secretary of State Hillary Clinton placed second, followed by Brazilian President Dilma Rousseff, making the top three spots unchanged from last year. The list includes women involved in policymaking, entertainment, technology and nonprofit organizations, among other fields. They were ranked according to influence, the amount of money they control or earn, and media presence. The magazine noted Merkel's resolve in preserving the European Union and her influence over the euro zone's ongoing debt crisis. Clinton was applauded for her handling of crises such as the release of a trove of diplomatic cables by the anti-secrecy group WikiLeaks. Forbes cited Rousseff for her leadership of the world's eighth-largest economy and approval ratings within her country. The list featured newcomers such as actress and performer Jennifer Lopez and billionaire philanthropist and widow of Apple founder Steve Jobs, Laurene Powell Jobs. Mr. Pranab Mukherji has ascended the highest office of the nation gracefully. He, having occupied ministerial berths in the cabinets of Mrs. Indira Gandhi, Narsimha Rao, Rajiv Gandhi and Dr. Manmohan Singh, will bring a lot of experience to the highest seat and will, may be, give a new meaning to the office of the President of India. 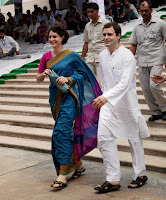 If this brings lots of hopes to the beleaguered country, Rahul Gandhi’s expected proactive role in the Congress’ affairs is likely to give a fresh energy to the monotony that surely seems not to go so well with the agile and alive youth of the country. More often than not, the elders have always welcomed and patronized youth power, drive, initiative and accomplishments, besides working as a sobering effect and effectively checking the youthful zest from going above aboard. With Rahul Gandhi having worked extensively with the youth brigade of the Congress during the last couple of years, he can take up big responsibilities now. This will, indubitably, bring about better understanding of men and matters and will go a long way in bringing about a well oiled and cohesive team to take the party to the top, come 2014. Rahul Gandhi is already in the enlightened company of Congressmen who have the grassroots experience in politics. 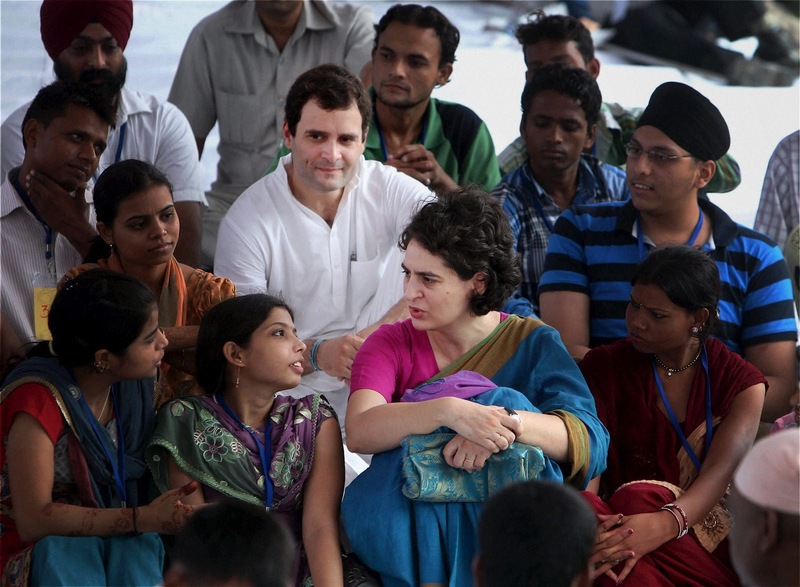 There still should be quite a handful in the Youth Congress corridors who could help change the face of the country. Rahul Gandhi, with all his hard work with the Youth Congress workers should have made an assessment of their capabilities by now and should groom them further in the fine art of politics. He should entrust them with more responsibilities where they can act in concert with the masses. They need to help out people with their genuine problems since they’ll be capable of pulling the right strings for genuine causes. They can take a leaf out of the book of the Youth Congress, post emergency. 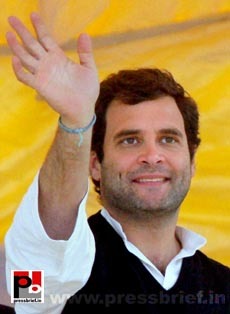 Rahul is the pivot round which the wheel of the youth will revolve in a very smooth and cohesive manner. The sharing of firsthand experience by the ex- youth Congress big guns with the emerging youth brigade will be a big positive for the party. This should encompass all the states and ought to be done on a very regular basis. It is the right time that Rahul Gandhi set the ball rolling by working as a conduit between the old and the young youth Congress leaders who may, in turn, rope in the cadres for a more pro-active role. The Monsoon session of the Parliament saw a different Sonia Gandhi, the UPA Chairperson. During the proceedings of the first day of the monsoon session, the members saw an positively aggressive face of the Congress President when senior BJP leader and MP LK Advani termed the ruling Congress-led UPA coalition as illegitimate. Sonia Gandhi and Congress benches erupted in protests when Advani, initiating a discussion on the recent ethnic violence in lower Assam, suggested that the UPA had lost its legitimacy after the controversial trust vote necessitated by the Left's withdrawal of support over the Indo-US nuclear deal in 2008. The comment by Advani irritated the UPA chairperson and she furiously gesticulated towards the BJP benches. Taking a cue from her, Congress MPs interrupted Advani and insisted that the reference be withdrawn, rejecting Advani's explanation that his attack was directed at UPA-I rather than the current dispensation. Sonia Gandhi made it clear to BJP benches that she was not willing to settle for anything less than an outright withdrawal of the remark. She has on occasions reacted to Opposition provocations, but on Wednesday showed sustained aggression till the BJP leader bowed to the Speaker's advice and withdrew his comment. Sonia Gandhi displayed the perfect quality of a matured leader. With the uncharacteristic display of aggression, Sonia Gandhi seemed to be more active, especially in the absence of Pranab Mukherjee. The Congress President has shown her class and maturity when she forced party MPs from Telangana to abort their plan to disrupt the House with their demand for statehood for the region. A determined Sonia Gandhi firmly asked Congress MPs from Telangana not to disrupt proceedings. After the T-block raised slogans, Sonia Gandhi told the MPs that their behaviour is unacceptable, saying it gave the Opposition an opportunity to allege Congress is orchestrating sloganeering to stall Parliament. Sonia told the Congress MPs that they should not embarrass the party. Her intervention helped the government avoid sniping from within. This positively aggressive face of the Congress President proves to be very beneficial for the Congress who has been under attack on various charges and anyone who watched the earlier proceedings in the Parliament, could have felt a fact beyond doubt that it was Sonia Gandhi who scored full points by displaying one of her best parliamentary performances. Everyone says that Congress President Sonia Gandhi is normally a cool person. She believes in action and so does not talk much.. But the Monsoon session of the Parliament witnessed an aggressive Sonia Gandhi who has been directing the Congress MPs to take on the Opposition defending the ruling alliance. On the first day of the monsoon session, the UPA chairperson forced senior BJP leader L K Advani to withdraw an objectionable comment made by him terming the UPA as illegitimate, from his speech during an adjournment motion against the government. Next day, she intervened effectively when Shailendra Kumar from the Samajwadi Party raised the issue of ensuring reservations in promotions for SC/ST government servants. Further during a discussion on the killing of six Sikhs in a US Gurudwara, Sonia Gandhi prompted Congress MPs and even parliamentary affairs minister Pawan Kumar Bansal to aggressively defend the party against the Akali Dal's accusations that Congress hadn't done much for the Sikhs. It is a fact that Congress President was never seen so aggressive. But this time, she did the correct job as the chairperson of Congress-led UPA. She always realised that it is her responsibility o defend the ruling coalition whenever it is under attack. When BJP leader LK Advani called UPA illegitimate, Sonia Gandhi correctly pointed out that he went beyond the limit of parliamentary discipline and she spearheaded the protest against L K Advani in Lok Sabha, forcing the senior BJP leader to unconditionally withdraw his remark. The Parliament has been witnessing stormy scenes in the wake of recent CAG report on coal block allocations. India’s Comptroller and Audit General (CAG) Vinod Rai in his report has noted in his report “The government and auditors are not adversaries but are on the same table since the objective is to upgrade governance and to ensure a totally leakage-free delivery system of government projects, schemes and practices to ensure there are no loopholes and lacunae”. By this what he meant was that the benefit of the schemes and policies meant for the people should reach them without any lapses, transparently. Here we should recall what our former Prime Minister RajivGandhi had said. The creator of modern India had said that 85 paise per rupee allocated for development got siphoned off before reaching the intended beneficiaries. On many occasions he expressed his concern that the poor are unable to avail the benefits of the welfare funds sent for them by the government the way it should have been. His son and Congress General Secretary Rahul Gandhi also has been quoting his father’s statement that when centre sanctions one rupee for the poor only 15 paisa reaches them. The young Congress MP from Amethi also has his own idea to ensure transparency in administration and he wants further upliftment of the downtrodden. Rahul Gandhi is having the opinion that Aadhar UID card will ensure more transparency in the safe passage of the central funds to the poor without any hindrance. "Every citizen of this country will have an identity card as a proof of their existence by the Aadhar scheme. Further the card will include the Bank account number along with the Aadhar Card Number so as to ensure connectivity and transparency and with this the Central funds will directly reach the account holder," argues Rahul Gandhi. The recent CAG findings clearly underline the need for ensuring transparency in public administration. If the government sends any amount of money for the welfare of the poor, it is also necessary that it makes sure that the entire funds reach the beneficiaries. The development of our nation will be possible only if we ensure this fact.. That is what Rajiv Gandhi wanted, Rahul Gandhi argues for and the people have been eagerly waiting for. Congress General Secretary Rahul Gandhi is interacting with the media in Uttarakhand. We are in the process of implementing democratic measures in the elections in both Youth Congress and NSUI informed Congress General Secretary Rahul Gandhi. Rahul Gandhi said that he could get good knowledge about proper internal democratic elections from Kerala, and he is trying to implement those across the country. The information gathered through the Right to Information Act confirms that regular interventions by Sonia Gandhi were instrumental for some of the key legislations introduced by the Congress-led UPA government at the Centre. For instance, on January 14, 2011, Sonia Gandhi wrote to the Prime Minister, pointing out that domestic workers were not included in the Protection of Women against Sexual Harassment at Workplace Bill, 2010, a legislation that NAC had been examining. "Domestic work is under-valued and poorly regulated and the workers are often underpaid and ill-treated. Their workplace being the confines of private homes, domestic workers, especially live-in workers, are prone to sexual harassment and abuse," wrote the Congress President. "This being so, exclusion of domestic workers from the purview of the Bill enhances their vulnerability," added Sonia Gandhi. The final draft of the Bill, passed by the Cabinet in May 2012, duly includes her recommendation on domestic workers. Sonia Gandhi continues to give firm but polite directives to the government. On August 20, 2010, the UPA chairperson wrote to the then law minister M Veerappa Moily, asking him to coordinate with the Ministry of Women and Child Development for an effective legislation to address sexual offences against children. "In the above context, the Ministry of Law and Justice may work in coordination with the Ministry of Women and Child Development to enable the finalisation of such a draft legislation, so that it can be brought to Parliament expeditiously," says the letter by Sonia Gandhi. She wrote another letter to the then Home Minister P Chidambaram on January 18, 2011, on the issue of Jarawa tribes of Andaman and Nicobar islands. Raising concern over local tourism operations and the highway passing through the Jarawa reserve, Sonia Gandhi emphasised, "The Ministry of Home Affairs may coordinate with them (Tribal Affairs Ministry) so that all issues related to the Jarawa tribe are comprehensively addressed." On October 27, 2010 Sonia Gandhi wrote to the prime minister saying, "As NAC firms up the draft Bill, it might be useful for the government to consider preparation for a timely and successful national roll-out of this ambitious Act." The Congress President also suggested Dr. Singh on November 10, 2010, to consider the rural development ministry's proposal to involve the Registrar General and Census Commissioner to conduct socio-economic survey to gauge the number of below poverty line families. "May I suggest that the proposal mooted by MoRD be examined in your office," she wrote. Within seven months, the proposal was examined by the Prime Minister's office and got the Cabinet's approval on June 19, 2011. The above mentioned facts prove beyond doubt that Sonia Gandhi played an important role in making many of the land mark policies by the UPA Government at the Centre. We can see the touch of Sonia Gandhi in National Rural Employment Guarantee Scheme, Right to Information Act, Mid-day meal scheme for the school children, Sarva Siksha Abhiyan, Anti Communalism Bill and Food security Bill. Sonia Gandhi is also keen to get the Women Reservation Bill implemented. Pt. Nehru dreamt a progressive Nation, Indira Gandhi took his dream forward, Rajiv Gandhi put the country among the top nations in the world and now Sonia Gandhi has been contributing high to make a strong and self reliant India. UPA chairperson and Congress President Sonia Gandhi has been consistently directing the Congress-led UPA Government at the Centre. The latest information gathered through Right to Information Act shows that she has the crucial role in most of the important legislations and policies made by the Congress-led central government. As per the details Sonia Gandhi wrote almost one letter a month to the Prime Minister over the past two years. Sonia Gandhi has been regularly giving directions to the United Progressive Alliance government and she has been making proper interventions for the legislations like food security, sexual offences against children, manual scavenging, communal violence, domestic workers and tribal welfare in particular. As per the information the Congress President has written 25 letters to Prime Minister Manmohan Singh and 17 letters to various Cabinet ministers since the National Advisory Council (NAC) was constituted for the second time in 2010. Sonia Gandhi, who heads NAC, has actively championed her social reforms agenda by writing to the Prime Minister most often, as many as four times, on various aspects of the National Food Security Bill. Of the 17 letters written to Cabinet ministers, four related to the Mahatma Gandhi National Rural Employment Guarantee scheme, followed by three on issues pertaining to the Forest Rights Act. New Delhi: Congress President and UPA chairperson Sonia Gandhi on Sunday called for swift action against people behind the violence in Assam and those spoiling harmony. "What is happening to Northeast Indians is shameful. The guilty should be punished," she said. Sonia Gandhi was addressing a function to confer the 20th Rajiv Gandhi National Sadbhawana Award in New Delhi. Prime Manmohan Singh also was present along with his senior cabinet colleagues and party leaders. The award with a citation and Rs 5 lakh cash was given to DR Mehta, the founder of Bhagwan Mahaveer Vikalang Sahayata Samiti. "All sections of the society should come together to create such an atmosphere. This is true service of humanity," said Sonia Gandhi noting that the situations that have arisen in the country today are the one related to social unity and harmony. The Prime Minister said that Rajiv Gandhi knew very well that India can progress only when all the countrymen can live together with peace, tolerance and harmony. Congress President and UPA Chairperson Sonia Gandhi called for stern action against those disturbing social harmony in the country in the aftermath of Assam violence. She described the ethnic clashes in the northeastern state as a matter of "great sorrow and concern". The Congress President added that all sections of society should condemn what happened in some states against the people of northeast after the ethnic clashes in Assam. "The central and the state governments should take stern action against those who are spoiling the harmony," she said noting that maintaining social amity was one of the biggest challenges before the country in the present circumstances. Sonia Gandhi stressed that the people of the country living anywhere have all the right to reside and work in any part of the country. The Congress leader also She said that the biggest challenge before the country since Independence has come from elements, who are enemies of social harmony and unity and only those are true patriots who fought such elements and promoted social solidarity. Giving the award to DR Mehta, the founder and chief patron of Jaipur based Bhagwan Mahavir Vikalang Sahayata Samiti, Sonia Gandhi said Rajiv Gandhi always fought against social and communal tensions and hatred. "Social harmony was not an issue but the basic value for him," said the Congress President. 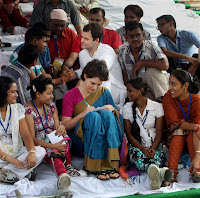 Congress General Secretary Rahul Gandhi while interacting with the media in Uttarakhand said that the youth constitutes 70% of the population in the country. He was responding to a question whether Congress would allow more young candidates to contest in the coming elections. My goal is to ensure that more and more youngsters enter politics through Youth Congress and NSUI and I fully concentrate on these jobs. I do not have any other target as of now, said Congress General Secretary Rahul Gandhi while talking to the media persons in Uttarakhand. Congress President and UPA Chairperson Sonia Gandhi will visit Barmer on August 30 to inaugurate the ambitious Bamer lift canal project. Sonia Gandhi will be accompanied by Union ministers and chief minister Ashok Gehlot. The UPA Chairperson will inaugurate the project at Adarsh stadium at a grand function. Chief engineer (special project) Ruparam said a sanction of Rs 681.66 crore was received on February 1, 2007 for the Barmer lift canal project and L&T, Chennai, was given the work order through a tender on March 31, 2008. The head work for the canal has been made at 1435 RD of Indira Gandhi Canal project at Mohangarh in Jaisalmer. Starting from this point, separate pipelines of 195km have been laid. The project will cater to the need of 691 villages of Barmer-Jaisalmer, Barmer city, BSF and Barmer's Uttarlai air force station air personnel. Also, 529 villages of Barmer and 162 villages of Jaisalmer will be benefitted. A reservoir has been constructed at 1435RD in Mohangarh which will have a capacity of 3,845 million litres and will have storage enough for 21 days' supply. Apart from this, water treatment plant and clean water reservoir have been made. The water would be carried to Barmer city through the 195km long pipeline with two pumping stations. An intermediate pipelinem 1,500 mm thick and 45.15km long is also laid from Mohangarh to Bhagu ka Gaon. Another pipleline from Bhagu ka Gaon to Kumbharon ki Dhani is 75.65km long and 14,00 mm thick. From Jaisalmer to Barmer city, the pipleline is 74.25km long and 900mm thick. In the first phase of the project, water has been supplied to 45 villages and Barmer city on an experimental basis. For the second phase, approval for an amount of Rs 202 crore has been received and pipelines for carrying water to 172 villages will be laid. New Delhi: The Forbes magazine ranked German Chancellor Angela Merkel the most powerful woman in the world for the second year. in a row in the annual list dominated by politicians, businesswomen and media figures. U.S. Secretary of State Hillary Clinton placed second, followed by Brazilian President Dilma Rousseff, making the top three spots unchanged from last year. 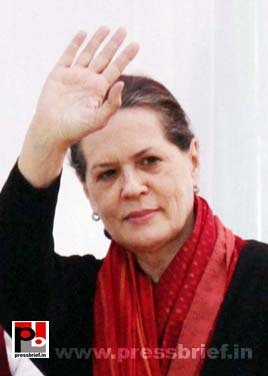 Sonia Gandhi, the President of the Indian National Congress, stands at No. 6. 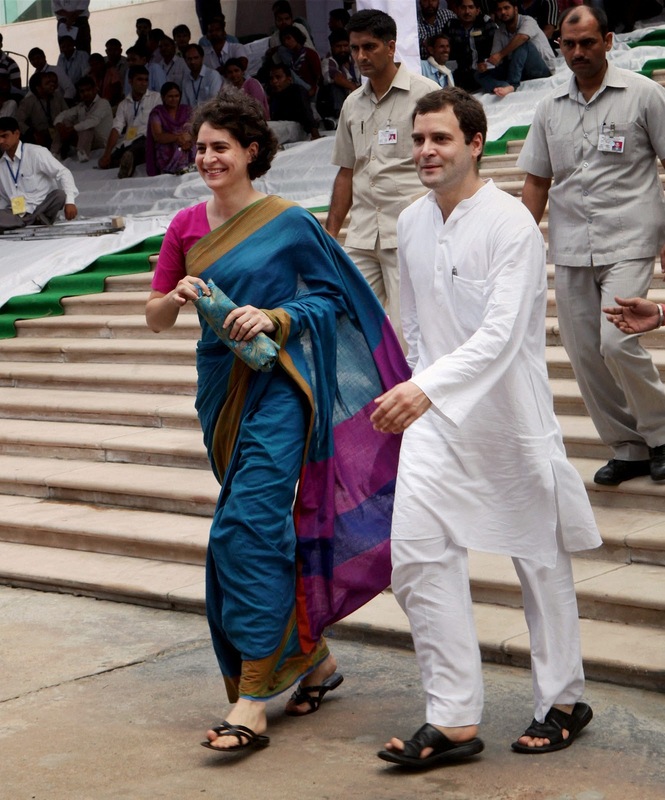 Congress General Secretary Rahul Gandhi and his sister Priyanka Gandhi Vadra distributed tricycles to the disabled persons at a function organized by Rajiv Gandhi foundation to commemorate the 68th birth anniversary of late Prime Minister and their father Rajiv Gandhi. The function was held at Jawahar Bhavan in New Delhi where 180 vehicles were distributed to selected people. The Rajiv Gandhi Foundation distributed 450 vehicles to disabled persons across the country. Last year, 226 people were given the vehicles. 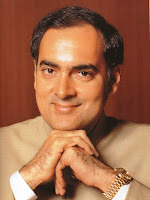 Rajiv Gandhi's birth anniversary was on August 20. President Pranab Mukherjee and Prime Minister Manmohan Singh led the nation in paying rich tributes to late Prime Minister Rajiv Gandhi on his 68th birth anniversary on Monday. The senior leaders paid floral tributes at Vir Bhumi, the samadhi of Rajiv Gandhi. Sonia Gandhi, Congress President and the wife of Rajiv Gandhi also laid flowers at the samadhi on the occasion alongwith her daughter Priyanka Gandhi Vadra and Robert Vadra. NEW DELHI: President Pranab Mukherjee and Prime Minister Manmohan Singh led the country in paying rich tributes to late Prime Minister Rajiv Gandhi on his 68th birth anniversary. They paid floral tributes at Vir Bhumi, the samadhi of Rajiv Gandhi. Congress President and wife of Rajiv Gandhi Sonia Gandhi, daughter Priyanka Gandhi Vadra and her husband Robert Vadra, also laid flowers at the samadhi on the occasion. Defence Minister A K Antony, Lok Sabha Speaker Meira Kumar, Deputy Chairman Planning Commission Montek Singh Ahluwalia, MoS in PMO V Narayanswamy, were among the other leaders who paid floral tributes at the samadhi. School children later marched towards the samadhi with a Tricolour to showcase a performance depicting communal harmony. Classical devotional music was being played throughout the programme. Rajiv Gandhi, who heralded the information and communication technology revolution in the country, was born on August 20, 1944 and served as the sixth Prime Minister of India from 1984-1989. He was assassinated by the LTTE on May 21, 1991 at Sriperumbudur in Tamil Nadu while addressing an election campaign. “I am not a decision maker in distribution of tickets in the Congress. My role is confined to Youth Congress and NSUI”, said Congress General Secretary Rahul Gandhi in Uttarakhand. He was responding to a question whether more youngsters would get tickets in the next elections. Rahul Gandhi informed that he would put in efforts to ensure that sufficient youngsters also get tickets in the elections. Congress President and UPA chairperson Gandhi attended a Roza iftar organised by the locals at the Asia Lawn later in the evening during her recent visit to Raebareli. She also announced a number of welfare projects for her parliament constituency. Sonia Gandhi informed that as soon as land is provided necessary steps would be taken and a Girl’s college will be built in the name of Indira Gandhi. A central school has also been approved for Bachrawan area, she said assuring that children of her constituency would get good education. Congress President and UPA Chairperson Sonia Gandhi visited her parliament constituency, Raebareli. It seems that the people of Raebareli were eagerly waiting for their favourite leader. The rousing welcome given by the people was an example for this. When Sonia Gandhi apologized to the people for not visiting them earlier due to personal reasons, the people acknowledged this with due respect. When she assured them that she would continue her fight for the development of Raebareli, the crowd acknowledged it cheerfully. They know their leader Sonia Gandhi and also realize her sincerity and the concern for the constituency. Sonia Gandhi said that she would always prefer to work for its development. The Congress president announced a number of development schemes for the district. Sonia Gandhi laid the foundation stone of a four-lane Lucknow-Rae Bareli section of a 70-km road and two-lane Rae Bareli-Allahabad section of the 106 km national highway-24B. The project is worth Rs.900 crore. Congress president and Raebareli MP Sonia Gandhi visited her Parliament constituency where laid the foundation stone of a four-lane Lucknow-Rae Bareli section of a 70-km road and two-lane Rae Bareli-Allahabad section of the 106 km national highway-24B. The project is worth Rs.900 crore. Sonia Gandhi informed that as soon as land is provided a Girl’s college will be built in the name of Indira Gandhi. A central school has also been approved for Bachrawan area, she said assuring that children of her constituency would get good education. She recalled that Sharda Sahayak and Saryu Nahar Yojna around Rae Bareli have been given the status of national projects and promised that her efforts would continue to bring more programmes and projects to the area. The entire country has now been discussing about the recent findings of the CAG report. While pointing out some of the scenarios India’s Comptroller and Audit General (CAG) Vinod Rai in his report has mentioned “The government and auditors are not adversaries but are on the same table since the objective is to upgrade governance and to ensure a totally leakage-free delivery system of government projects, schemes and practices to ensure there are no loopholes and lacunae”. By this what he meant was that the benefit of the schemes and policies meant for the people should reach them without any lapses, transparently. One can recall now at this juncture what had our former Prime Minister Rajiv Gandhi had said. The creator of modern India and a great visionary late Rajiv Gandhi had had said that 85 paise per rupee allocated for development got siphoned off before reaching the intended beneficiaries. He also was very much concerned for the fact that the poor are unable to avail the benefits of the welfare funds sent for them by the government the way it should have been. Further, his son and Congress General Secretary Rahul Gandhi also repeatedly quoted the statement of his late father on many occasions that when centre sanctions one rupee for the poor only 15 paisa reaches them. The young Congress MP from Amethi also has his own idea to ensure transparency in administration and he wants further upliftment of the downtrodden. Rahul Gandhi is having the opinion that Aadhar UID card will ensure more transparency in the safe passage of the central funds to the poor without any hindrance. "Every citizen of this country will have an identity card as a proof of their existence by the Aadhar scheme. Further the card will include the Bank account number along with the Aadhar Card Number so as to ensure connectivity and transparency and with this the Central funds will directly reach the account holder," argues Rahul Gandhi. The recent CAG findings clearly underline an important aspect that what we urgently should do is to ensure transparency in public administration. If the government sends funds for the poor, it should reach the beneficiary without any loss. The country will advance further and surge ahead only if the government and the administration show the will-power to address this crucial issue. That is what Rajiv Gandhi wanted, Rahul Gandhi argues for and the entire countrymen have been eagerly waiting for. If we promote the youth through democratic processes, automatically he can grow more and can prove his ability for leadership. This is the way to promote more youngsters to leadership, said Rahul Gandhi. The Congress General Secretary was interacting with the media in Uttarakhand.